Marco Reus has been recalled by Germany with Joachim Low opting to rest both Marc-Andre ter Stegen and Jerome Boateng for the upcoming Nations League clash with Netherlands. Barcelona goalkeeper Ter Stegen is left out to recover from a minor shoulder injury while Boateng is omitted so the defender can train with his club during the international break. Germany have lost two of their three League A Group 1 meetings so far and face relegation from the section, a poor campaign in the inaugural UEFA tournament following their dismal World Cup title defence in Russia. Real Madrid midfielder Toni Kroos is in the squad to face Netherlands on November 19 in Gelsenkirchen but will not be involved in a friendly against Russia four days earlier. Bayern Munich centre-back Boateng explained the decision for him to be left out of the squad was taken following discussions with Germany coach Low. "After a very good and trusting conversation with the national coach, after a hard year for the two upcoming internationals I get a break to continue to work on my fitness in Munich," Boateng wrote on Twitter. "I wish my team all the best for the games against Russia and the Netherlands. Thanks to the national coach!" 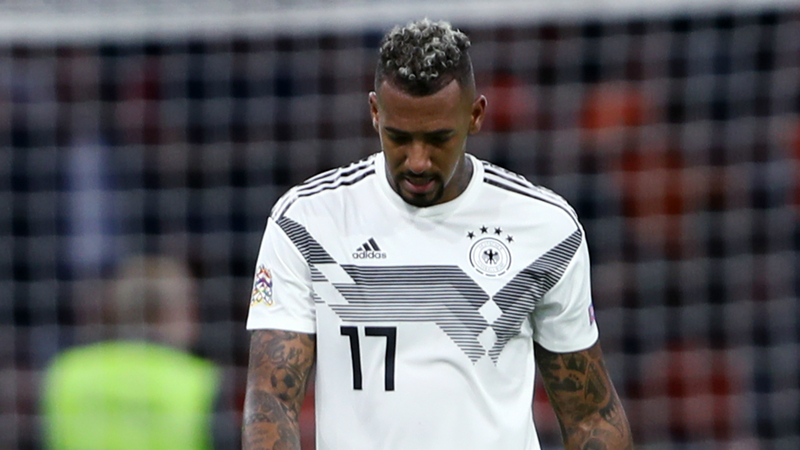 And Bayern boss Niko Kovac suggested the omission of Boateng - a World Cup winner in 2014 with Germany - should not be taken as a sign that the 30-year-old's international future is over. "That's the decision of the Germany coach," Kovac told a news conference. "Not fielding Jerome is a novelty but it doesn't mean he won't play for them again in the future. He has the chance to train for us in the international break. "He's done very well recently and I see no need to talk about this or assume it will be the end of his time in the international team. Joachim Low told me and I'm sure he will tell Jerome [the reasons why he was not selected]." Reus' recall comes after his fine form led Borussia Dortmund to top spot in the Bundesliga ahead of their Klassiker clash at home to Bayern. The 29-year-old has scored six Bundesliga goals, with Dortmund four points clear of Bayern going into Saturday's game at Signal Iduna Park. Germany squad in full: Bernd Leno (Arsenal), Manuel Neuer (Bayern Munich), Kevin Trapp (Eintracht Frankfurt - on loan from Paris Saint-Germain); Matthias Ginter (Borussia Monchengladbach), Jonas Hector (Cologne), Mats Hummels (Bayern Munich), Thilo Kehrer (Paris Saint-Germain), Antonio Rudiger (Chelsea), Nico Schulz (Hoffenheim), Niklas Sule (Bayern Munich), Jonathan Tah (Bayer Leverkusen); Julian Brandt (Bayer Leverkusen), Julian Draxler (Paris Saint-Germain), Leon Goretzka (Bayern Munich), Kai Havertz (Bayer Leverkusen), Joshua Kimmich (Bayern Munich), Toni Kroos (Real Madrid), Thomas Muller (Bayern Munich), Marco Reus (Borussia Dortmund), Sebastian Rudy (Schalke), Leroy Sane (Manchester City); Timo Werner (RB Leipzig), Mark Uth (Schalke).